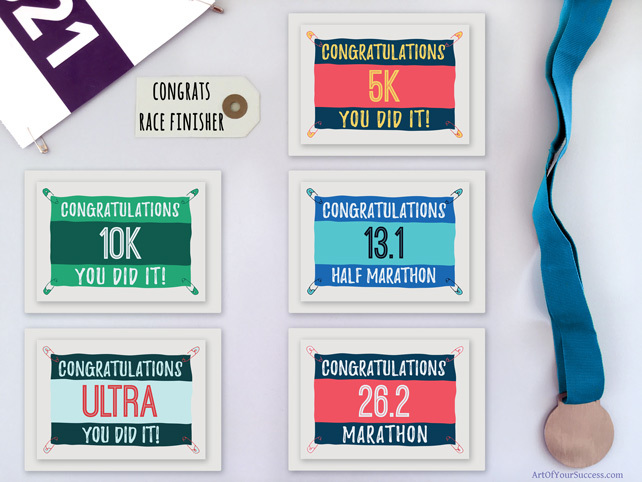 Congratulate a 10k runner by giving them a special running card. They’ll treasure it much more than a text message. Whether they’re running their first 10k, or just run a 10km best, they’ll really appreciate your support. 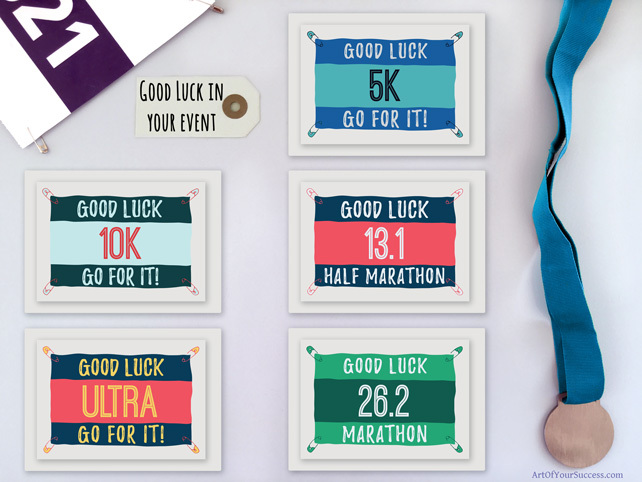 For all distances, both good luck & congratulations, see sports events cards. A6 cards, folded at the top. Printed on TruCard – a specialist greeting card material that is coated and scratchproof on the outside, and uncoated inside so it’s easy to write on. Supplied with high quality white envelope. All packaged inside a cellophane bag to keep them pristine til you’re ready to use them. I am so thrilled I found you on Google! Perfect! Keeps me organised all day – everyone at work loves it! Its recipient and I were both really pleased with the design and quality. A big thank you. And your customer service was second to none. These cards are even better in person! Very impressed! And Sarah went above and beyond to help me! I will be buying from Art Of Your Success again and again!! I can’t say enough about AOYS and Sarah! Amazing customer service and excellent quality of card!!!! Two orders were placed and everything was amazing. Kept in the loop at all times and love the cards and notepads. Delivery was so quick. Fantastic!! “Sarah has been involved in the creation of some of the Run Mummy Run designs and we have been delighted with her work. Sarah is so easy to work with plus friendly and fun! she can produce an excellent design for your business. Sarah is a keen runner and cyclist which works perfectly when she is designing design for the sports or events industry. “Sarah provided an amazing design service for our race medal and t-shirt, taking care of everything, from initial designs to delivery of the finished goods, with a minimum of fuss.